The WebMail Notifier has pretty light and optional sound alert software to tell you when you have email on one or all of your accounts, including Facebook. Dream Cheeky did what we do best with this product… helping you be more unproductive at the office. Now when you sneak off to the bathroom to check personal emails on your Blackberry, your trip will definitely not be wasted. WebMail Notifier supports: Gmail, Yahoo, Outlook Express, POP3, Weibo, Facebook, Twitter, etc. As Oleg explains “To write to HID device you either need an OUT endpoint or write to control endpoint.” In the end i used the Usb.setReport command similar to that used in the keyboard example where the keyboard LEDs are turned on/offI wanted to control the Webmail Notifier from an arduino. 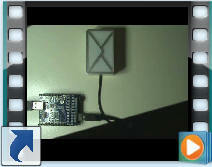 As this is a USB device i needed to use the usb-host-shield manufactured by circuitsahome. With a little help from Oleg from circuitsathome and with the windows program from Frederic Delhoume i finally maneged to get it working. The first three bytes are the brightness and colour coding. RR GG BB. It has 0x3F brightness as higher values do not increase the brightness. Enclosed is the arduino software to get it working. At the moment its just a code to get it to cycle the colours as shown on the video. Here are just some pictures and a short video of the program working. Here is the code for download. Interested in other shields look here.